Today was moving day for my son Ryan and his girlfriend Whitney. They went from a one bedroom apartment for the two of them and their dog Roscoe to a 2 bedroom townhouse. So much more space….Ryan’s hockey gear can be stored in the basement now….anyone involved in sports knows you want that gear as far away as possible! So, we picked Ryan up at their apartment at 10:30am and took him to the townhouse to pick up his truck so he could go get the trailer and his buddy’s to begin the moving process. He left the truck parked at the townhouse because his tires had gotten slashed the night before at the apartment…..kids with nothing better to do or did they just not like the look of Ryan or his truck?? Chris’ and my job was to stay at the townhouse and wait for the cable guy and watch Roscoe, no problem….just a bit boring, no furniture yet, no TV…..what to do, what to do. Shana got volunteered to help with the actual moving….what a trooper, it’s hot Shana you will wish you had shorts on. The cable guy was supposed to come between 11am and 2pm so Chris and I parked ourselves in our lawn chairs in the empty living room to wait. The cable guys never come at the beginning of the 3 hour window they give you, but today….there he was….shortly after 11:00. Poor Roscoe got closed into the bedroom upstairs while the cable guy did whatever it was he needed to do to get cable and internet hooked up. 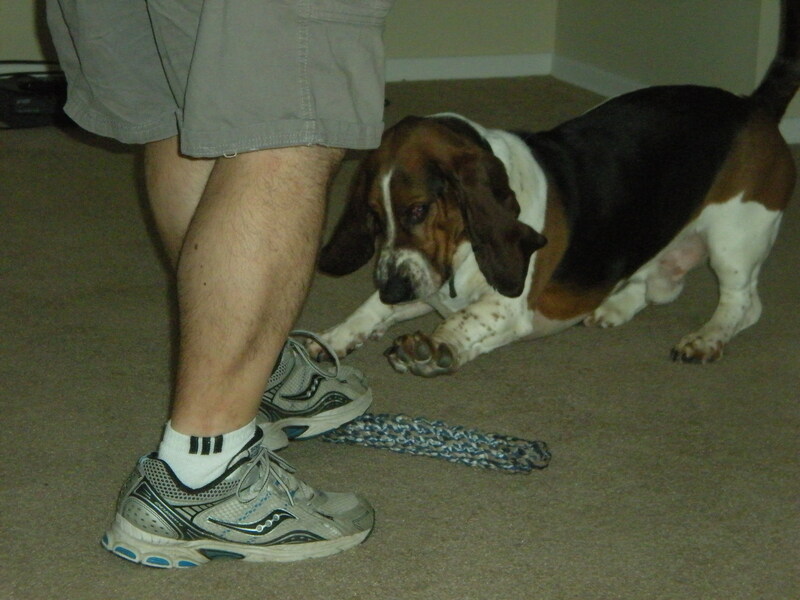 He finally finished and Roscoe was freed from the bedroom to wait in the empty room with us. For a while Roscoe sat looking around and it seemed he was wondering what kind of place he was brought to that was empty of any furniture other than 2 measly lawn chairs which were both occupied. And where were his people?? Chris spent some time entertaing him with one of his toys. In the meantime Erika arrived at home from her sleepover at her friends so Chris drove home to pick her up and bring her to the townhouse to help carry things in once the truck and cars got there. Lucky girl. After a couple of hours everyone arrived with load number 1. Too bad my job was to keep Roscoe out of the way so I was unable to help carry things in….supervising and watching the dog was really tiring work. Shortly after the first load arrived the pizza arrived as well….Break Time….you definitely need nourishment to keep working…..anyway, break time was over, and everyone was back to work…..in the hot humid temperature. The truck, trailer and cars were emptied and it was back to the apartment for a second load. Some of us stayed behind to help organize some of their stuff while waiting for the next load….or relax and watch some TV. 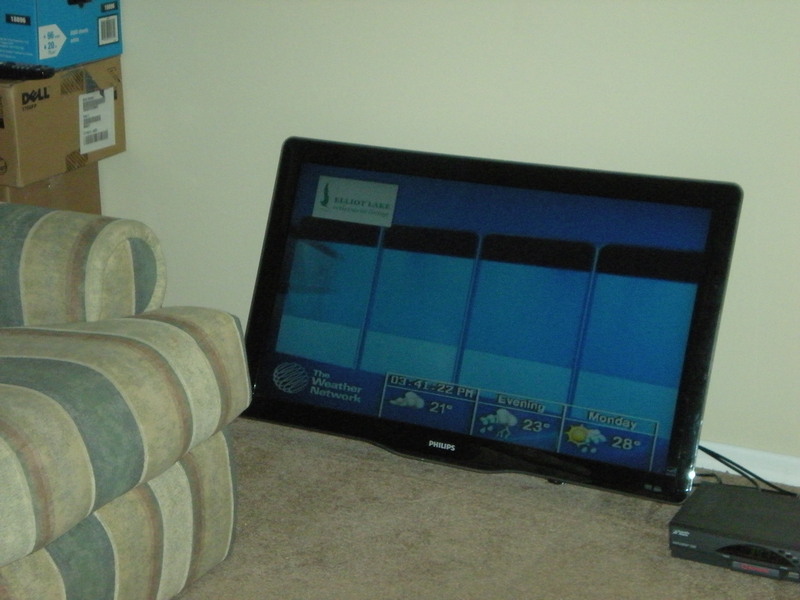 The TV was delivered on the first load and since the cable guy was already there no need to wait for a TV stand…..just prop the TV on the floor and get watching it……even if the show of choice was the Weather Channel. The second load arrived and was taken into the house fairly quickly, mostly by the girls, as the guys had wandered off somewhere…..I say time to call it a day. It was time to head home and spend some of what was left of the day relaxing with our puppies. It was such a hot and humid day…..we were all hot and tired as I’m sure Ryan and Whitney were too….I’m even betting that Shana wished she had taken my advice and worn her shorts. It’s nice to know there is lots of help when you need it….Ryan’s family, Whitney’s family and a couple of Ryan’s work buddies all helped out with the move….and you know what they say…..many hands make light work. Maybe they didn’t find it light work…..
Now the real work begins for Ryan and Whitney……..figuring out where to put everything. We will actually come by for a visit (and a home cooked meal) once we think they are all settled in.